ELC Clinic students who demonstrate an excellence in and a commitment to improving environmental law and policy through their work are now eligible for a special prize. 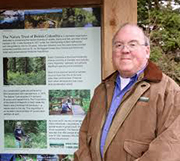 Former Director of Fish and Wildlife and Assistant Deputy Minister of Environment James H. C. Walker was one of the most influential wildlife advocates over the last several decades. As a fisheries scientist with expertise in wildlife and land use management, James worked in the civil service for almost 30 years, establishing numerous conservation programs and initiatives and spearheading changes in policy and legislation. He played a key role in doubling the Provincial Park system, developing the Forest Practices Code, protecting areas like the Muskwa-Kechika watersheds and the Khutzeymateen Grizzly Bear Reserve. In retirement, he continued his efforts to protect the environment through volunteering with environmental non-profits. He was also a good friend of the ELC’s. When James passed away earlier this year after a brief illness, his friends and family decided the most appropriate way to memorialize him was to establish an annual prize in his name for ELC Clinic students.